Food Network's Tanya Holland has a lovely small restaurant in Oakland called Brown Sugar Kitchen. The food is fresh and lovingly prepared from local organic ingredients and sources Southern foodways for breakfast and lunch. I had the cornmeal waffles which were crisp and lacy and wonderful served with brown sugar butter and apple cider syrup. Next time, I'm up for the shrimp and grits. Sara, I so agree. 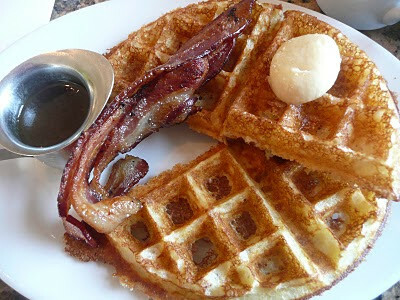 You might also want to check out Jack London Square's Chicken and Waffles restaurant. A bit more of a diner rather than gourmet vibe but also very good.